Eighty-one percent of Americans want one million or fewer legal immigrants to the United States per year, according to new polling data released Monday by the Harvard-Harris poll, a number lower than the 1.38 million who came to the United States in 2015. Plurality preference for between 1 and 250,000 new immigrants a year persists across white, Hispanic, and black Americans, as well as moderates and self-identified Democrats. Such a rate of immigration would be lower even than the rate expected from the RAISE Act, a bill backed by the administration and expected to cut immigration in half in ten years. These results are part of a broader pattern among a public that, according to the poll, is critical of President Donald Trump's performance on immigration policy but broadly sympathetic to the White House's agenda in that domain. Forty-four percent of respondents approve of the job President Trump is doing on immigration, as compared to 56 percent disapproving. The largest group within that set were strong disapprovers, at 42 percent. Disapproval was especially concentrated among millennials, African-Americans, and self-identified Democrats. But while those numbers are less than ideal for the president, the public seems to generally be on board with a more restrictive, merit-based immigration system. Americans prefer a system of prioritizing would-be legal immigrants based on their ability to contribute, based on their education and skills, over one based on immigrants having relatives in the United States, 79 to 21 percent. That includes a majority of white (79 percent), Hispanic (72 percent), and black (85 percent) citizens, as well as majorities of Democrats (72 percent), liberals (65 percent), and Clinton voters (72 percent). Additionally, Americans support doing away with the so-called diversity visa lottery 68 to 32 percent. 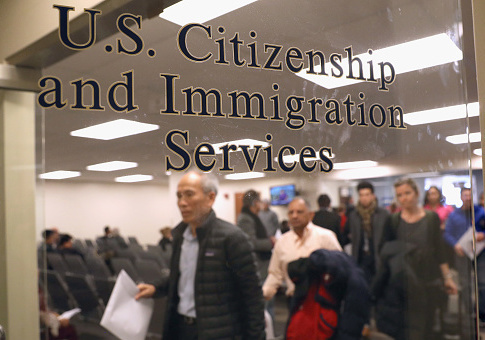 The lottery, with its 50,000 visas allocated to nations otherwise underrepresented in the mix of immigrants arriving in the United States, has been a frequent target of criticism by Trump and congressional Republicans. Respondents also backed tougher border security: 61 percent say that current security is inadequate, and 54 percent support a "combination of physical and electronic barriers" along the southern border. Americans generally are sympathetic to the plight of recipients of DACA, the Obama-era program which protected illegal immigrants who arrived to the United States as children from deportation and which drove the federal government to a halt over the weekend. Seventy-eight percent of respondents believe that children brought in illegally, even those now in their 20s and 30s, should be given work permits; a similar number believe those individuals should be given a path to citizenship. Respondents did not, however, believe that parents and relatives of DACA recipients should be given preference for immigrating, opposing that measure 60 percent to 40. They also opposed Democrats shutting down the government over DACA, with 58 percent opposing and 42 percent supporting. All of this adds up to an immigration deal about which the poll explicitly asked if respondents would back "a congressional deal that gives undocumented immigrants brought here by their parents work permits and a path to citizenship in exchange for increasing merit preference over preference for relatives, eliminating the diversity visa lottery, and funding barrier security on the U.S.-Mexico border." Sixty-five percent to 35 percent, respondents said they would, including 68 percent of Hispanics, 64 percent of Democrats, and 63 percent of liberals. After the three-day shutdown, the Senate voted on Monday afternoon to move forward on three weeks of funding for the government, with general agreement that any long-term budget solution would include addressing the fate of DACA recipients and the administration's immigration priorities. It is unclear what any final deal will look like, or how—if at all—it will reflect Americans' opinions on the topic. This entry was posted in Issues and tagged Immigration, Immigration Reform. Bookmark the permalink.